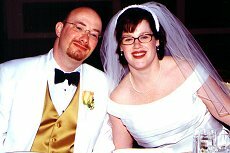 Bill and Jacqueline, April 1, 2000. (William Francis Walsh) was born in the coal-mining town of Pottsville, Pa., on Dec. 20, 1961, but my family moved to Michigan almost immediately thereafter. I spent my formative years in Madison Heights, a lower-middle-class suburb of Detroit, where I attended Franklin D. Roosevelt Elementary School, John Page Junior High School and Lamphere High School. I was a shy, extremely skinny (you'd never know it now) little egghead. Sometimes the egghead overruled the shy kid, as when I gave my second-grade classmates a detailed explanation of what was going wrong with Apollo 13. Sometimes insanity overruled the skinny kid, as when I launched my amateur boxing career. Fighting as an 88-pounder in the 92-pound class, I concluded that career with a 0-1 record. But I got a trophy, for finishing second in a field of two, and I can say I fought in the same tournament as Tommy Hearns. n 1979, the family up and moved to the suburbs of Phoenix -- Mesa, to be exact. I stayed in the area 10 years to the day, long enough to attend the University of Arizona, start my career at the now-defunct Phoenix Gazette and buy my first house, in the cow town-turned-suburb of Chandler. pon moving to the D.C. area in 1989, I spent one more year as a suburbanite, in Alexandria, Va., before moving to the Capitol Hill neighborhood of Washington. I now live in a wonderful 1909 Victorian house with my incredibly wonderful wife, Jacqueline Dupree (who was hired by The Washington Post the year after I was, as the paper's intranet developer). We have two bundles of joy: a wacky cat named Gordie and a bottle-cap-fetching auxiliary backup cat, Guga. acqueline, who taught me everything I know about computers, thereby making my Web life possible, has a Web site of her own. We got married on April Fool's Day in Las Vegas. oth of my brothers are editors as well: Terence is a copy editor (assistant news editor) at the News-Post in Frederick, Md., and Kenneth is a copy editor at the New York Times News Service. y main interests, outside of bitching about things and staring at a computer screen, are staring at a TV screen (no, I'm not ashamed) and doing just about anything related to the sport of tennis. I shouldn't like those embarrassing "reality" shows, but I do. "Survivor" remains an event in my household, but "The Amazing Race" has overtaken it in our heart. "Ed," "The Simpsons," "Law & Order" and "Frasier" top my more respectable viewing lineup, and I eagerly await new (or old) episodes of "Mr. Show." As for tennis, I'm mostly a watcher (and commentator, if you care to listen), but I also play fairly well (4.0 or so on the National Tennis Rating Program scale), and I recently started playing again after forays into golf and squash. h, and I don't complain too loudly when dragged to Las Vegas for a two- or three- or four- or five-day bender of free drinks and low-stakes blackjack. (Yes, we got married there because we like the place!) Sightsee on the Strip, but camp out downtown. Stay at the Golden Nugget and play at the Golden Gate. You'll be golden. y other Web site is strictly a cult indulgence. It's all about the Phantom Limbs, a brilliant but hard-to-explain band from Tucson. I used to run a site about Muhammad Ali, until Ali's lawyers demanded their hero-worship fee. 'm trying to maintain a couple of blogs. Off-Topic allows me to vent on road rage, incompetent cops, favorite TV shows and least-favorite radio commercials, among other things. The Spin, when it's not sadly neglected, is about tennis.